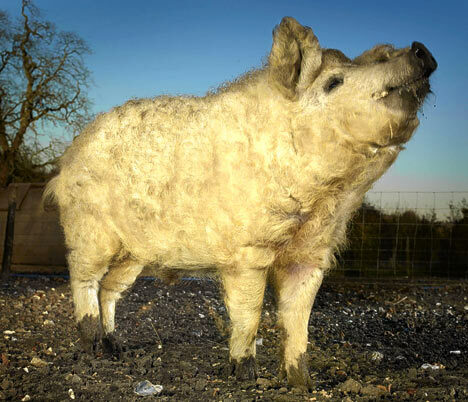 The four-legged Boris represents what [his owner] hopes will be a renaissance for the Lincolnshire Curly Coat pig, often called the sheep-pig, and a breed which became extinct here 37 years ago. In his quest to reintroduce the breed, he discovered British farmers had exported many Curly Coats during the early 20th century to Hungary, where their coat helped them survive harsh winters. There they were cross-bred with the Mangalitza, a similar breed, creating the ‘Lincolista’. Is it just me? Or does she look maniacal about toast? It might not be quite the best thing since sliced bread. But it’s certainly a close-run thing. 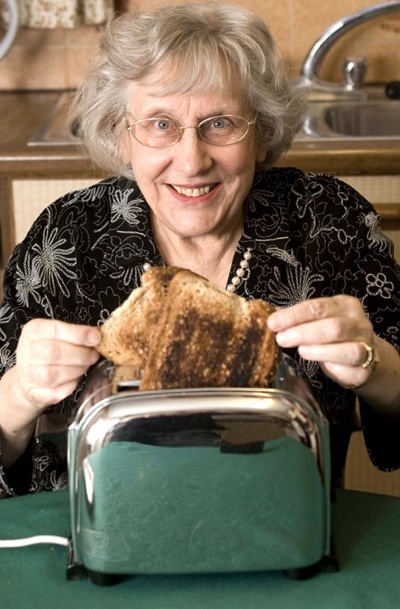 When Joan Lopes picked out a shiny silver toaster as a present for her parents, little did she realise it would still be working some 56 years later. Since she bought it in 1951, the simple but stylish two-slicer has browned to perfection thousands of pieces of bread – along with the occasional teacake – serving three generations of the same family. December 27, 2007 Posted by oldstersview | appliances, People	| Comments Off on Is it just me? Or does she look maniacal about toast? Want a smoke? Stick your head in the hole. No, really. A German bar owner has got round a smoking ban by cutting holes in the wall so customers can stick their heads out to have a cigarette. Michael Windisch, owner of the Maltermeister Turm bar and restaurant in Goslar, Lower Saxony, cut three holes next to tables in his restaurant after local authorities introduced the ban on smoking in all eating places. Customers who want to smoke can stick their heads through the large holes and their hands through the other two so they can have a cigarette. A curtain has been mounted to keep out the cold. December 27, 2007 Posted by oldstersview | People	| Comments Off on Want a smoke? Stick your head in the hole. No, really. There is brazen, and then there is not very smart. A man with what police say is a lengthy theft record was caught stealing from marked Madison Heights patrol cars. The Daily Tribune of Royal Oak [Michigan] reports an officer caught the 48-year-old man from Oakland County’s Waterford Township about 2:30 a.m. Friday rifling through the unlocked cars in a lot behind the suburban Detroit police station. Detective Lt. Corey Haines says two police flashlights were stuffed up his sleeves. A Madison Heights police badge and pair of police gloves also were in his pockets. Police say the suspect, whose name wasn’t released, could be charged with larceny and trespassing.